the early bird gets the….Vintage! Spring! It’s my favorite time of year. Plants are starting to grow, the weather is starting to get warmer (well sort of), and there’s more light in the day. It’s been unusually cold and crazy, plus we’ve had an epic flood here in Grand Rapids which you’ve likely seen on the news. None of this has stopped me from another favorite this time of year- rummage sales! And so besides my super busy artgoodies production schedule I’ve been getting up early, standing in line-in the cold, to bring you fantastic vintage treasure! 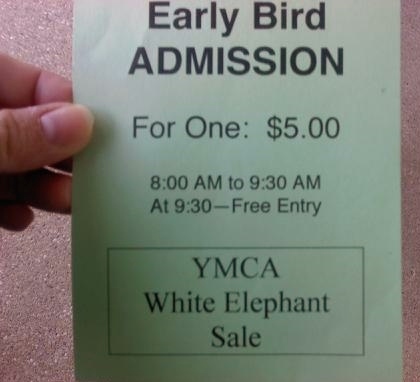 Because unless you get there EARLY, the vintage is gone gone gone! I’ve snagged great linens, salt and pepper shakers, kitschy kitchen and home items, melmac, tins, trays, holiday, and the rest of my usual treasure tricks! I’ve started listing in my vintage shop and I promise you, you’ll want to check back often! color of the month April! I’m ready for garden time, well, as soon as the weather cares to cooperate! 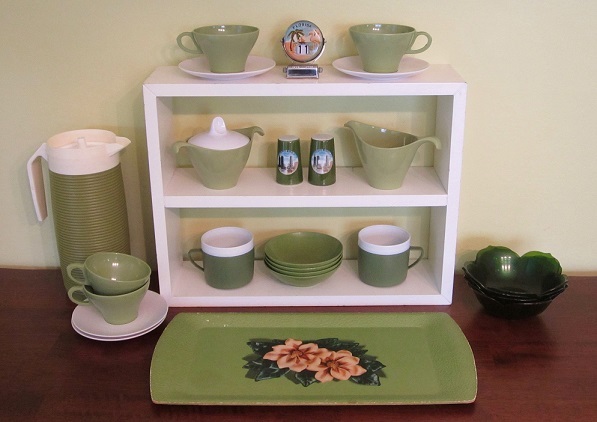 Ode to green and growing things with the color of the month this April! I've been holding onto this vintage tablecloth for a bit. I love it's salad kitcheny theme. Makes me want to get my lettuce in the garden! 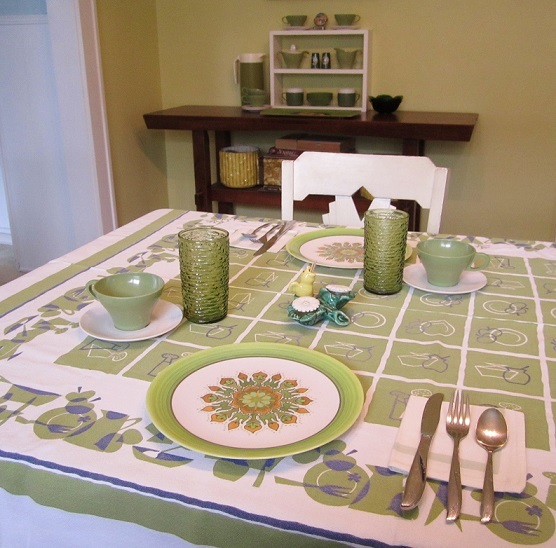 Fun melmac plates and cups and saucers, plus vintage green textured glasses make for a nice setting. Pale green striped vintage napkins anchor the silverware and the unusual salt and pepper/toothpick holder is a new personal fave!